Naughty as they may be, you need to pay extra attention to your cat to keep the fur balls healthy. Similar to dogs, cats are easily dehydrated too. Hence, it’s crucial that there’s always clean water waiting for them around the corner. However, providing your cat with stale water can also risk their health. Why? Because old water can collect dust and impurities that can harm your feline’s health. Therefore, you should consider investing the best cat water fountains. A cat water fountain will circulate and filter out the impurities from the water to provide fresh and clean water to your pet at all times. 1Cat Mate Pet Fountain – 70 Fluid Oz. Animate, established approximately 20 years ago, is known for providing quality pet products. 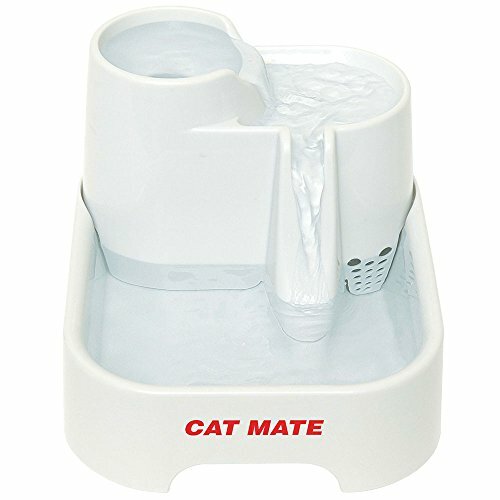 First on the list is the cat mate pet fountain that can accommodate up to 70 oz. of fluid. It features multi-height drinking stations. The ramp works by reducing water splashing and scaring your cat away. Also, its Isolated Pump System doesn’t make unnecessary noise while on the operation. The polymer-carbon filter replacements are readily available at your convenience. The Animate company offers a 3-year guarantee upon purchase of the product. Best of all, it is sold at an affordable price. If you have multiple cats in your house, this product is for you. The PetSafe Drinkwell stainless steel cat water fountain is rich in capacity. It can accommodate up to 128 oz., ensuring your felines and canines that they will never run out of the water. Thanks to its 1-5 free-falling streams, it can encourage your pets to drink more water as much as they can. The package includes a replaceable carbon water filter that gets rid of any impurities in the water. It also helps to remove foul smell and taste. You can adjust the flow control cap accordingly, allowing you to customize the water flow. Thanks to its advanced 360 design, it also allows multiple pets to drink at the same time. Furthermore, the water fountain is easy to clean, and all parts are dishwasher-safe. This sleek-looking ceramic cat water fountain is from Pioneer Pet. Thanks to its circulating drinking water, it can encourage your pet to drink more from it. The capacity of this water fountain is approximately 60 oz., and its continuous filter cleans the water using the charcoal filter. You can replace the filter (readily available in from the manufacturer) anytime you want. Thanks to its simplistic design, this cat water fountain is easy to clean. You can also take it apart and clean the pump itself to ensure that it only provides fresh and clean water. All parts of this cat water fountain are dishwasher-safe. 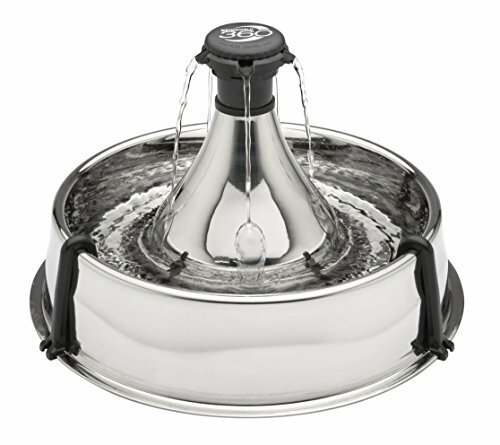 Another product from PetSafe, we have the Avalon pet water fountain. Similar to the previous product above, it is made of ceramic with no cheap plastic parts. It can accommodate up to 70 oz. of water, allowing multiple pets to drink from the fountain at the same time. There are two levels of drinking basin—the upper and lower level. The high level of the drinking basin is most suitable for arthritic pets who have difficulty in bending down. Also, the parts can be easily detached and cleaned thoroughly. It is dishwasher safe and built to last for a long time. This water fountain features dual-free falling streams to encourage your pets to drink more water. The carbon water filter is sure to provide fresh and purified water for your pets anytime. 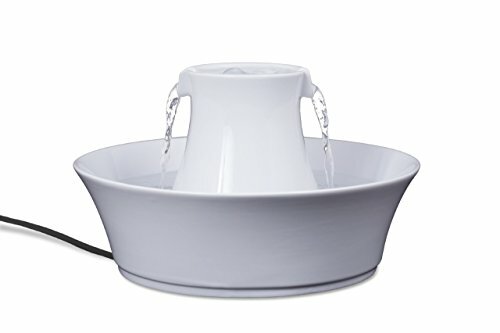 If you are on a budget, you might want to check out the Flexzion cat water fountain. At its affordable price, you can lessen the hassle of refilling your feline’s water fountain now and then. Thanks to its gravity fed design, it requires little to no maintenance at all. Its antibacterial material makes it ideal to use for pets with sensitive conditions. It is made of high-quality plastic that can resist stain and odor in the long run. However, it is not safe to wash in a dishwasher but easy to clean. The PP plastic material of this product is not suitable high temperature. 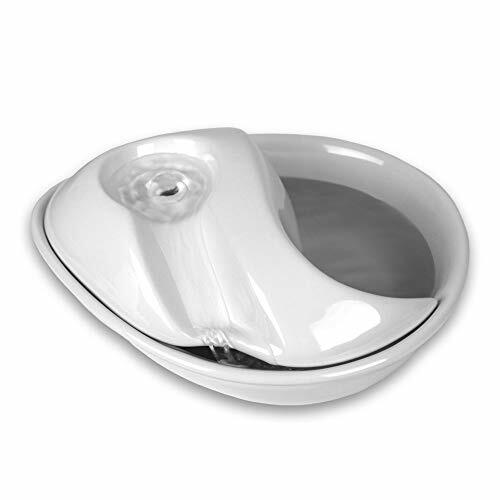 It features a recessed handle area that makes the water fountain portable and easy to carry. The anti-slip rubber feet will keep the water fountain in its place even in the wet environment. It may not be the cheapest item we have on our list, but this cat water fountain from PetSafe is worth every penny. It is made of ceramic that is both durable and elegant. The water fountain features a dual-free falling stream. It can act as a motivation for your pets to drink more water. The package includes carbon water filters for fresh and pure water anytime they want to drink. 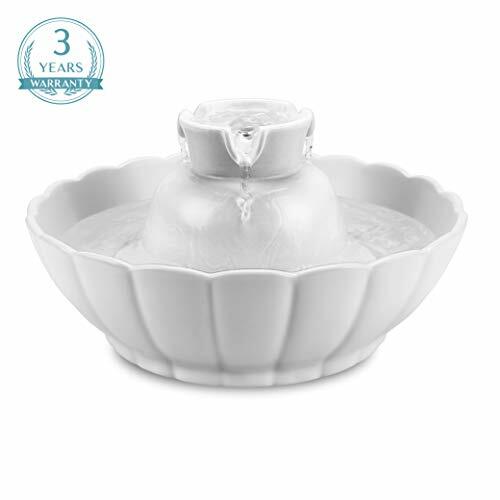 Moreover, similar to the previous product above, it has two levels of drinking bowls. If you have an arthritic cat or dog, these water leveling may be helpful. 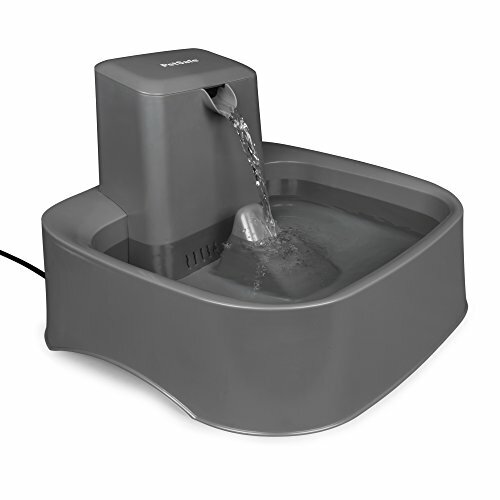 The ceramic design makes this water fountain more hygienic and easy to clean. Another sleek-looking cat water fountain is from IPettie. It is made of a quality ceramic material that’s both eco-friendly and non-toxic. Pet owners who have multiple pets at their house can benefit from its triple free-falling design streams that adds oxygen to the water and keeps it fresh. It also serves as an attraction to your pets, encouraging them to drink water. Compared to previous models, this cat water fountain features a dual filtration system. The mechanical and chemical system ensures to filter out any impurities, including pet hairs. It also prevents foul smell and bad taste. The whisper-quiet operation allows you to place the cat water fountain even inside your living room. This cat water fountain can hold up to 71 oz. You might want to check out the Aspen pet fountain, suitable for multiple cats in your household. 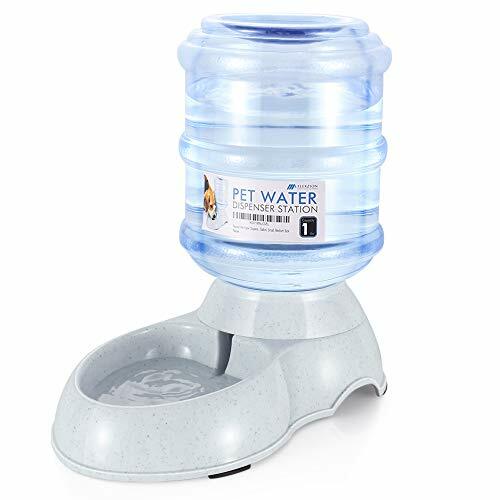 This cat water fountain provides oxygenated water with a translucent 50-ounce reservoir and a charcoal filter that you can replace later on. You don’t need to refill frequently because the reservoir works by adding water automatically. It also features a flow-control lever and its ultra-quiet operation makes it suitable for indoor use. 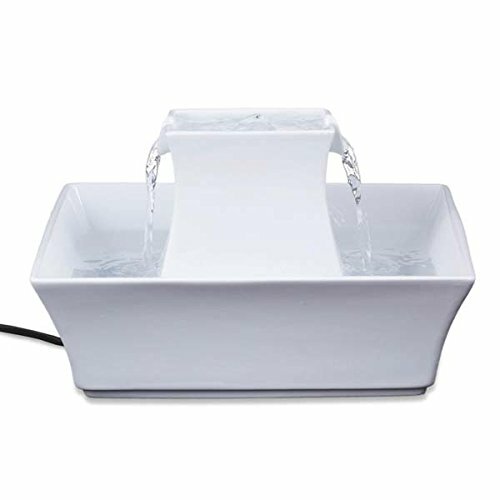 The cat water fountain is made of easy-to-clean plastic material and is resistant to stains. 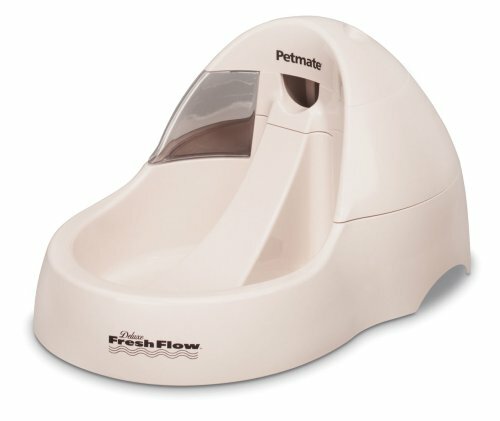 Lastly, we have the PetSafe pet water fountain. It can hold up to two gallons of water, making it an ideal choice if you have a large cat breeds in your house. The free-falling water stream can attract the attention of your pets to drink more water, decreasing the risks of kidney and urinary diseases. Its foam filter helps to get rid of pet hair and any impurities. The constant water circulation, on the other hand, helps to prevent any bacterial growth in your pet water fountain. It is made of a BPA-free plastic material that’s easy to disassemble and clean. You can adjust the water flow to suit your pets, and its quiet operation makes it an ideal choice for any household.